220 Thread Count 100% Cotton Extra-Long Twin Sheet Sets >These luxurious 220 thread count 100% cotton percale twin XL sheet sets by SPRINGMAID are the ideal college dorm bedding solution! 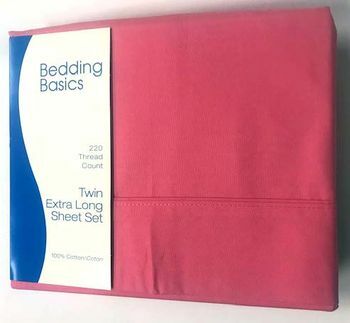 Send the kids back to school in style with these highly durable, top quality twin XL sheets that come in a wide range of colors�perfect for every dorm room and every personality! Each twin XL sheet set includes one top XL flat sheet (66x96"), one bottom fitted sheet (39x80") and a matching standard/queen pillowcase. The fitted XL twin fitted sheet will easily fit any extra-long twin mattress with a depth of up to 12�. Order twin XL sheet sets now to take advantage of our current inventory and pricing! Online orders can be placed right here from our completely secure site at anytime. 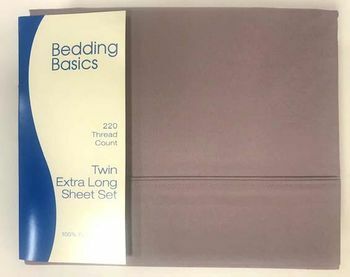 For more information on these or other twin extra-long sheet set options currently available here at Laurens Linens, simply give us a call toll-free at 877-233-2284! All XL twin sheet sets are also conveniently machine washable and drier friendly for extra easy care!